I did it! I completed the Nike Women’s Half Marathon ((and in under my goal time))! Overall I must say it was a great experience! My sister decided to stay with me and we had a great time chatting, taking pictures, and enjoying the absolutely amazing weather, all while running 13.1 Miles! We had a kind of odd experience in the hotel with the AC being on a sensor so we literally were running on no sleep but that did not hold us back. Because of the large amount of people running the race and everyone starting at once we began the race at very slow pace. This was actually a good thing for me because it allowed me to run much farther without taking a break. My biggest struggle through the race was trying to convince myself that I did not need to stop and use the bathroom. As we ran the race I kept thinking how bad I had to go and then I would see the line for the porta-potty and decided it really was not worth the wait! I am not sure if I am more proud that I finished the race in under my goal time or that I did not have to stop to use the bathroom at all! I was wearing my “running for two” tank top and got a few comments and congratulations along the way. Near the end of the race my legs started to get very tired. I was feeling the effects of not going on any official long training runs, but my walk-run method took care of that. We ended up finishing in 2:48 which was much quicker than I anticipated and very exciting! As we crossed the finish line the road was covered in red carpet and the little blue boxes and tuxedos were in sight! 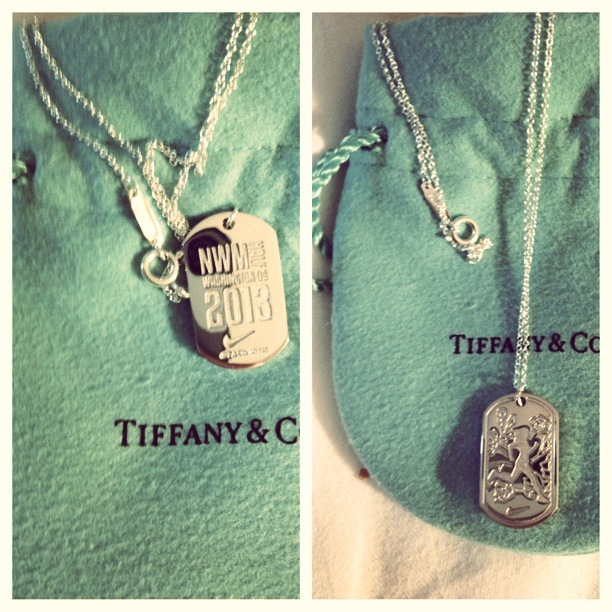 We were given our finisher medals and proceeded to get our finisher shirts which were the same color as our Tiffany’s boxes. By this point my legs were tired and we headed back to the hotel to devour our Georgetown Cupcakes that were waiting for us. What an amazing post-race treat! I would drive back to Georgetown right now to buy more if I had the time! This race had such a different feel than when I normally do a big race. I usually put so much emphasis on when I finish (even though I know it will not be that fast) and get myself so anxious and worked up. This race was just about finishing and having fun. I need to start running all races like this because I enjoyed it more than ever, and it was simply because of my outlook on it. Yes we got an awesome necklace, but even if I would have gotten a finishers medal that would be thrown in a drawer, I still know I would have enjoyed this race just as much. Now that the race is over I do feel very liberated from running. I went back to spinning class last night and it felt good to do something different. I had not been to the class in over a month and it seemed so hard! It was a good work out and I am looking forward to adding that back in my mix of weekly workouts. I hated that running felt like a chore to me, but I am glad I pushed myself to run as much as I did pre-race. I ended up logging 73.4 miles in the month of April- that seems so crazy to me! Since January I have logged 160 miles towards my 500 mile goal for the year. 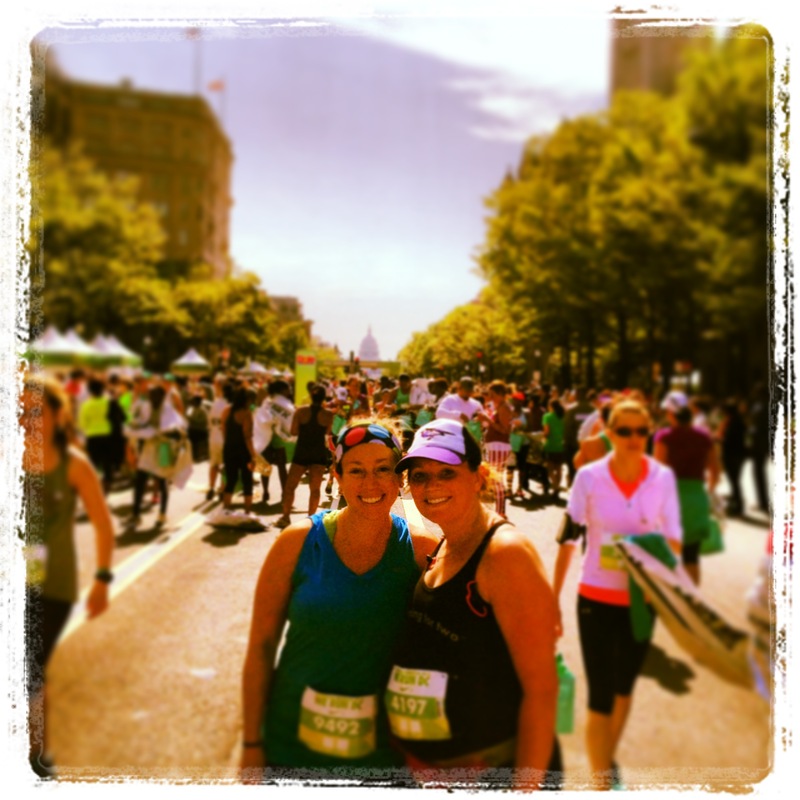 For May I am aiming for at least 26.2 since I entered into the JoggerMom Virtual Marathon I mentioned previously. I do not plan on making running a chore, or even a priority, but I know it will feel good to get out there every once a while and log some miles. Up next is a 5k on Sunday. Last year I walked the entire race with a co-worker but as long as I am up for it I will run- not for a PR but maybe a pregnant 5k best time? Why not?! Previous Post Bag is Packed!